Tyrrell Hatton secured his first victory on the European Tour at the Alfred Dunhill Links Championship at St Andrews in October 2016. England's Tyrrell Hatton was knocked out of the World Golf Championship Match Play after incurring a two-stroke penalty in his three-man play-off. Hatton accidentally nudged his ball on the green and did not replace it. He had narrowly missed his birdie chance on the first extra hole and went to tap in, but the ball moved slightly forward when he placed his putter down. Under a local rule, such accidental movement is no longer a penalty provided the player replaces his ball. Compatriots Paul Casey and Ross Fisher fared better, and are both through to the last 16. Hatton's defeat by Rafa Cabrera-Bello in the final round of group matches meant the pair went into a play-off with Charles Howell to determine who would advance to the last 16 at Austin Country Club, Texas. Cabrera-Bello and Howell resumed the play-off without him. 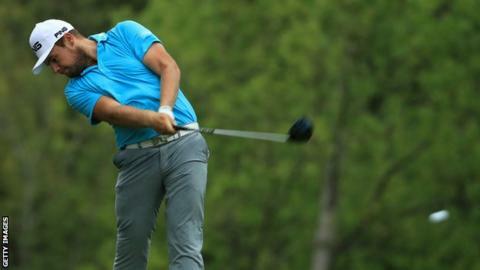 Howell went on to secure victory at the fifth extra hole and set up a clash with Spain's Jon Rahm. "I'm only human, I'm going to make mistakes as I've done today," said Hatton, who secured his first victory on the European Tour at the Alfred Dunhill Links Championship at St Andrews in October 2016. Rules official Steve Carmen told the Golf Channel: "What happened was he placed his putter behind the ball and caused the ball to move and then he putted from the new position. "We have a local rule in effect that if it's an accidental movement on the putting green you can replace the ball but he didn't replace the ball so he's played from the wrong place, and there's a two-shot penalty." There were no such problems for five-time major winner Phil Mickelson as the American remains on course for his first win since the 2013 Open by beating Ryder Cup team-mate JB Holmes 6&5. Mickelson will face Marc Leishman in the last 16 after the Australian, who won the Arnold Palmer Invitational on Sunday, came out on top in a three-man play-off in group three. Leishman, England's Lee Westwood and America's Pat Perez all finished with a 2-1 record after Westwood's victory over Perez, with Leishman then making a birdie on the second extra hole to advance. Denmark's Soren Kjeldsen had already booked his place in the last 16 and will face William McGirt for a quarter-final berth after the American defeated England's Andy Sullivan to maintain his 100 per cent record. Kevin Na defeated England's Matt Fitzpatrick with a birdie on the first extra hole to set up a meeting with Bill Haas. Two-time major winner Jordan Spieth joined Rory McIlroy in making an early exit after Japan's Hideto Tanihara defeated compatriot Yuta Ikeda to finish top of group five, with Paul Casey next in line for Tanihara. World number one Dustin Johnson, who is seeking a third straight tournament victory and a clean sweep of WGC events, defeated US PGA champion Jimmy Walker 5&3 to win group one. And England's Ross Fisher edged past former Open champion Louis Oosthuizen in a play-off to set up a last-16 clash with two-time Masters winner Bubba Watson.